Dataselfie is an extension that watches your behavior on Facebook. It looks how long you hover over posts, and tracks what you like, comment, and click on. It then makes guesses about what kind of person you are. Let's see how it did with me. In their personality prediction of me, if I read this correctly, is that based on my clicks/looks (green) and typed comments (white) it finds me an open, mildly conscientious, contemplative, competitive, and emotional person. It's difficult, though, to understand how they've arrived at some of these analyses. And if it's a straight read on how I interact on Facebook, I suppose I would say that I certainly do alter my behavior while online. I'm probably trying to be either humorous or sincere in my comments - which are few and far between. I can't quite believe that they'd actually have a good sense of my personality based on how little I feel like I actually interact with FB. Which perhaps is in fact indicated by how my green colored predictions are right down the middle - most of what I do on FB is just passive looking. Dataselfie appears to have a grasp on my general health and activity. It's wrong, however, in the final judgement - that I don't intend to start intend to start a business in the next few years. And a strange leap to make there, it would seem...onwards! Wow, surprisingly accurate. It claims up there that this is based not on the ads that flank my FB feed, but rather based on my personality type. If or if not true, it does seem to have me pegged here in every category. 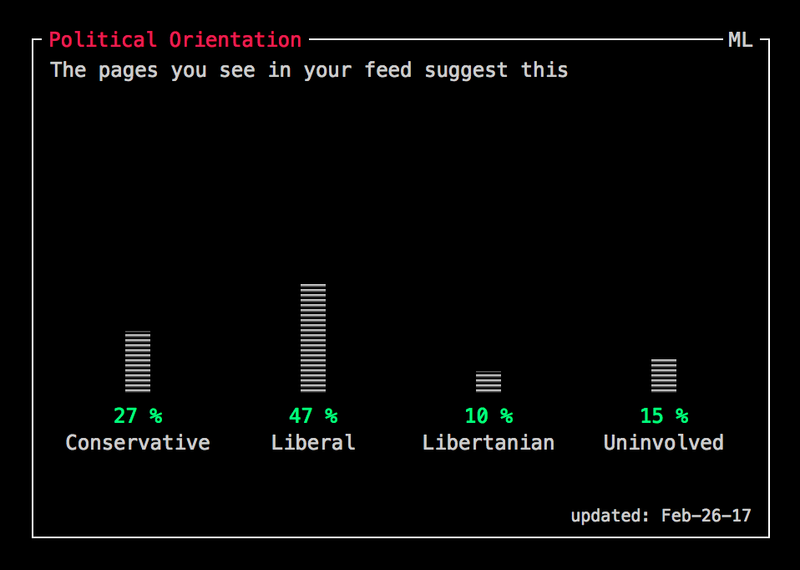 Politically, I would not have analyzed my feed as 27% conservative, that seems almost impossible. Ok this is getting weirder..i would have thought that "39% None" would be more like 89%. Hardly anyone I can think of in my feed has religiously oriented posts. And, here we are. Perhaps their most offensive prediction. I'm going to continue to believe I'm higher in intelligence and life satisfaction, thank you very much Dataselfie. But based on the pages in my feed this is what they see me. I wonder if this is why I don't like Facebook, because it is sort of an unrelenting stream of mediocore content. Or maybe everything gets dumbed down for FB. I wonder what pages you'd have to be seeing for it to rank you in the 99% percentile. And is Trump's takeover of all headlines and FB rants in fact most responsible for the dumbing down of my personal analysis? Lets says yes, I blame Trump. Also interesting here that they include my psychological gender (Female by just a bit, very interesting) and my leadership quality predictor at 49% (Sad!). Oh well, I'll just keep on keepin on at my FB life and hopefully start seeing and clicking on the things that will get these scores up.